Rcrumb.com can finally announce the release of Crumb's Limited Edition Genesis book. 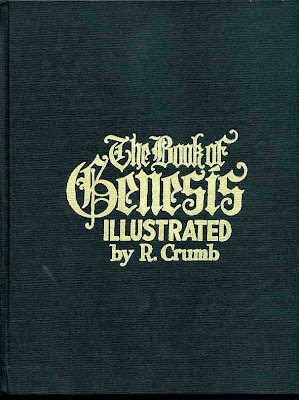 The edition is limited to 250, with each book slipcased, signed and numbered by Crumb. Also included in each book is a signed 9 color serigraph print (printed by Alex Wood of Wildwood Serigraphs) which measures 8 x 10". We were only able to secure 20 books from the edition, so the availability will be limited. Only one book per customer please. Each book will be sold at $488, less than the retail price suggested by WW Norton. To be released on Monday, November 16th. We apologize for the delay, but Norton did not ship this edition until Tuesday, November 10th. Black slipcase with color picture of Adam and Eve being expelled from Eden on front is: 9 x 11.5". Black hardcover of the book itself with gold type embossed: 8.75 x 11 1/8".